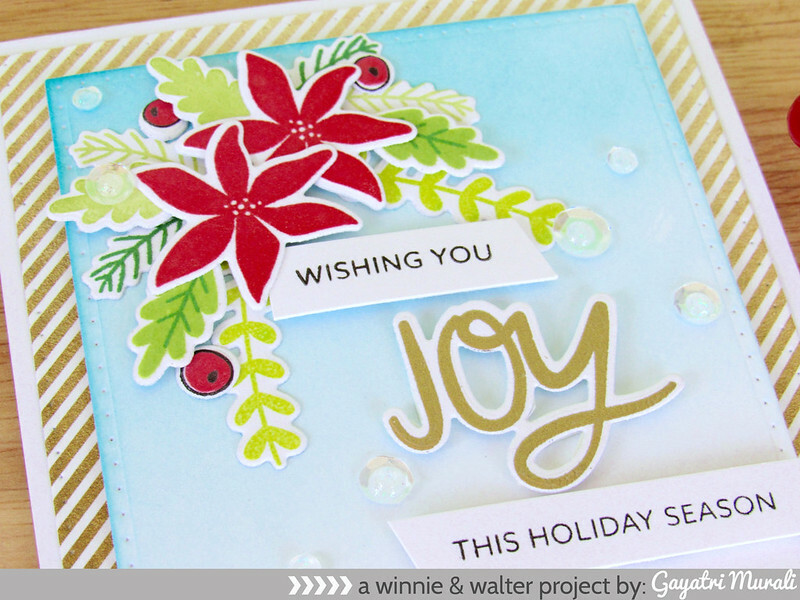 I am here sharing my project using Winnie & Walter’s newly released November products. The new products did not arrive on time, hence was not able to participate in the premieres and blog hop. So I will be sharing my projects I made using the new products over a few days this week. The stamp set and coordinating cutaway I am showcasing today are Frenchy’s Festive Florals. I stamped the images from the stamp set using a mixture of pigment and dye ink and die cut them all out. 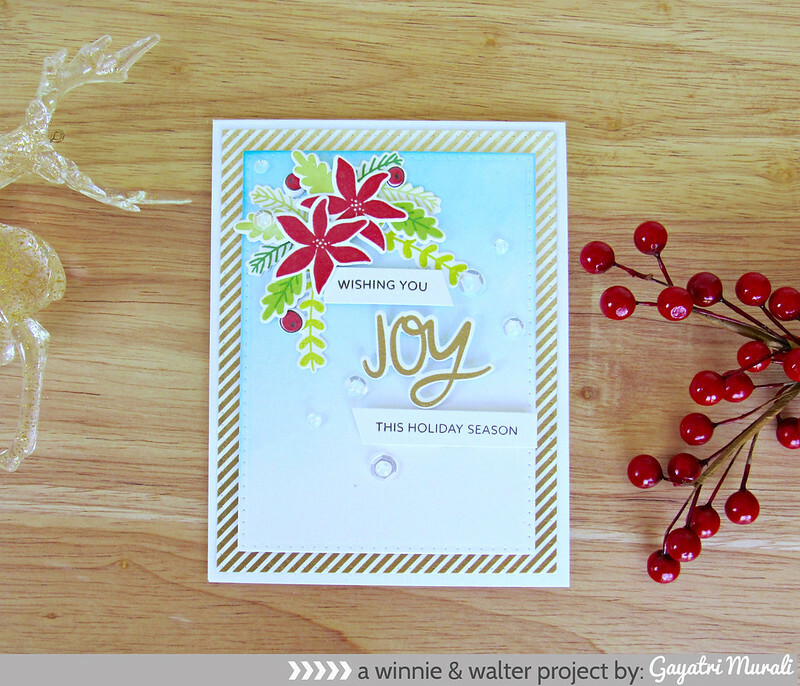 I gold heat embossed the “JOY” sentiment and die cut. The two rectangles are die cut using Essentials: Katherine Cutaway. I sponged Peacock Feathers distress inks on top of the smaller white rectangle panel. I clustered glued the die cut images on the top right corner of the smaller panel. Then below to the cluster to the left I adhered the “JOY” die cut sentiment using foam adhesives. Then I stamped the smaller sentiment on strips of white cardstock. I adhered these strips using foam adhesives. I adhered the smaller panel over the larger panel using foam adhesives and the whole panels to the card base flush using scor tape. The larger panel is pattern paper from My Mind’s Eye Charmed collection. I finally embellished with Pretty Pink Posh Sparkly Clear sequins. Hope you are inspired. Both the Frenchy’s Festive Florals and coordinating Cutaway are available for purchase from Winnie & Walter Store.